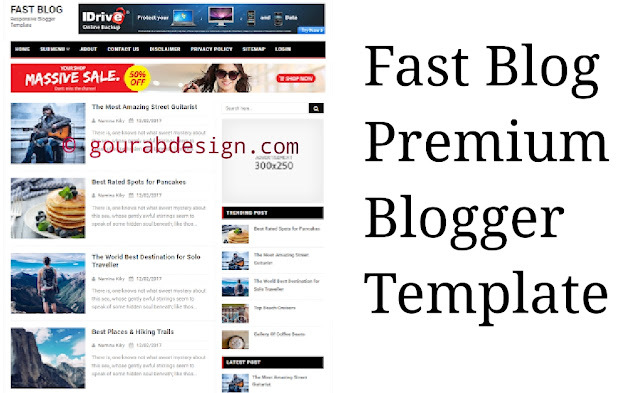 Fast Blog Responsive Blogger Template is a stylish and elegant that is easy for professional blogging to make. It's very sensitive, it's ready for widgets and has many advanced features. Quick Blog News, Newsletter, Magazine, or Publishing Sites In addition to Google ads and adsense support, use the best SEO ready and easy to use. With the useful tools, with good social sharing options, with carefully designed components, create a perfect and harmonious blog for you, for which is a great opportunity for news portals. It has powerful features and personalization options. It has uploaded many professional and useful widgets: Popular posts, Multilevel Drop-Down Menu / Mega Menu, Subscriptions etc. Please note:- Professional look.. Latest Updated free Version.. Optimizes JS file. Dear Friends, In the publication of our premium blogspot theme Collection, Super loading was a great theme. Of course, the non-English speaker can easily set the value of the model name of your website. Yes, this is the fastest blogspot model today. The original version is FREE HERE, but this theme is a great demand. I decided to do this in the past to complete the plan, everything is complete and the speed and availability download. My website started 6 months ago and I shared many content. Now, I've got some quick problems so I can load the blog response. So here's a this topic, This is my best choice because it has same to same AMP VERSION.. well Optimizes latest updated. If you like my article, then share it with a social site. So that everyone can get help.And yes, definitely subscribe to my website. So that you get notifications of every post I get. Hi technical joonak. Fix ho chuka hai. Ab check krke install kr lo. And thanks ki aapne is tarah mujhe bataya.